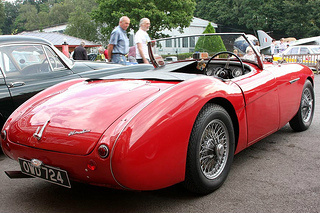 The Nash-Healey was a two seater sports car marketed specifically in the US during the period 1951 to 1954. It was, in fact, the first post WW2 convertible to be manufactured in the US, and was a joint venture between Nash-Kelvinator Corp, who provided the drivetrain, and Donald Healey's company, who were responsible for the chassis and body. In 1951, following on from his involvement with the Nash-Healey, Donald Healey realised there was a market opportunity for a fast, versatile, and cheap sports car that was more up market than the prevailing MG's, but less expensive than a Jaguar. He received agreement from the Austin Motor Corporation to use the engine, transmission, suspension and drivetrain from their Austin A90 Atlantic saloon car, which was being produced at that time. He then approached Gerry Coker, who designed the body for the Nash-Healey, to design a sports car that would be a big seller in America. 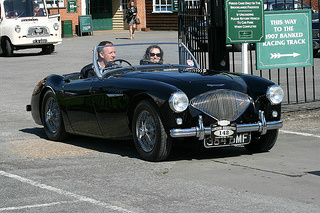 He named his new car "The Healey 100" since he was confident it would exceed the magic 100 mph. 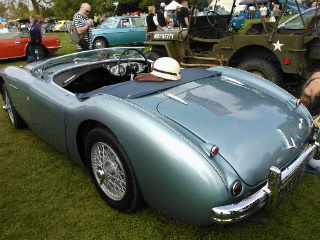 The car made its first appearance at the Earl's Court Motor Show in 1952, and was an immediate success. 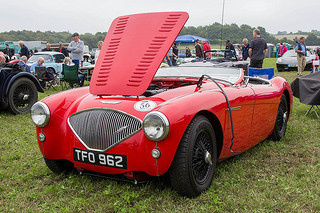 Prior to the show, the head of the Austin Motor Company was so impressed with the car that he offered to mass produce it under the brand name of "Austin-Healey". Originally, the cars were built at his Warwick factory, and used one basic design for the chassis. Following the agreement with Austin, he would be responsible for the design of the cars, whilst Austin's Longbridge factory would build and market them as Austin-Healeys. Both the body and chassis were built by Thompsons of Wolverhampton on a production line at Jensen Motors of West Bromwich. A total on nineteen pre-production BN1's were built at the Warwick factory, and all were left hand drive models. The first of these were destined for motor shows in New York, Los Angeles, and Frankfurt, and a US sales promotion tour. Subsequently, a prominent motoring magazine lauded the car as "The best handling car this year". 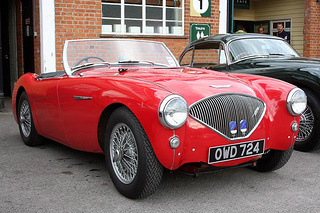 The first production cars received badges using the name Austin-Healey 100. The original engine of the BN1 sports car developed 90 bhp, but Donald Healey modified a version of this engine to produce 130 bhp. He designate this car the 100S, where "S" referred to Sebring. 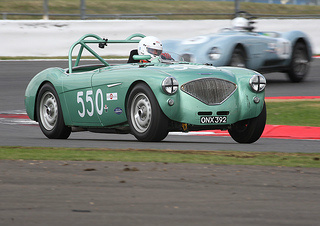 In fact, an Austin-Healey 100S, driven by Stirling Moss, came in sixth position in the 1955 Sebring twelve hour race, beating a D-Type Jaguar, and two Ferraris and Masseratis. 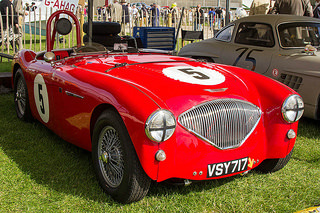 The market was so impressed with the performance of the 100S that Austin-Healey introduced the 100M version, where "M" referred to Le Mans. 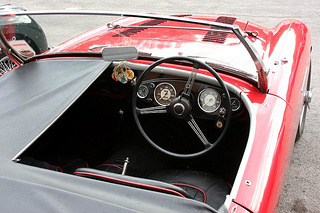 This variant was fitted with larger carburettors, higher compression ratio and pistons, and modified camshaft. In 1953, a BN1 won the award of International Motor Car Of The Year in New York, and a standard production car averaged 104 mph on the Utah Salt Flats. 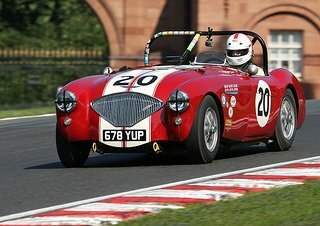 Also that year, Donald Healey reached nearly 193 mph when driving a 224 bhp, supercharged version of an Austin-Healey 100. By the time production ended in 1953, 10,030 BN1's were built, of which less than 10% were made with right hand drive. 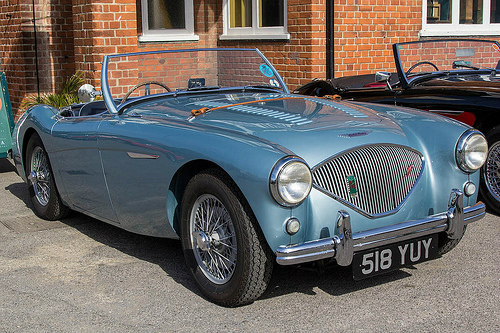 A 1953-55 Austin-Healey 100/4 BN1, in very good condition, would fetch around £34,000/$55,000, whilst an excellent example would command in the region of £44,000/$70,000.